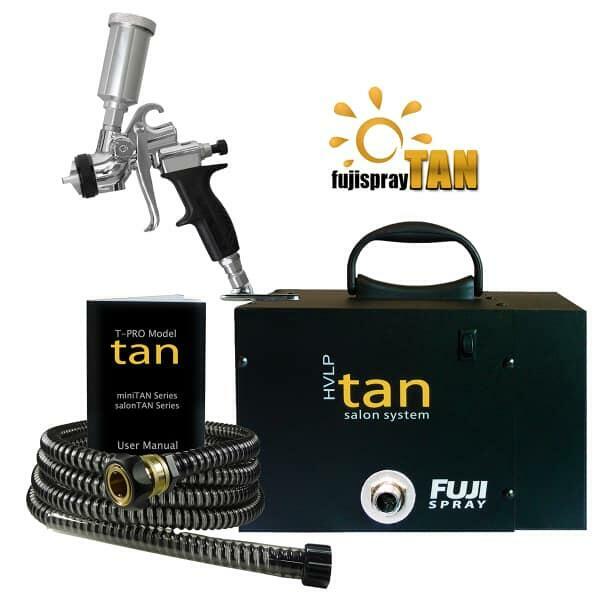 The Salon Tan Spray Tanning System by Fuji Spray has gotten a makeover. The new model, the Salon Tan T-PRO 4150 Spray Tan System, is fitted with the unique and highly advanced T-PRO Applicator that features a gravity cup. This new spray tanning system takes features from the old systems, like reliable, quality construction, easy setup, blow-dry settings and the high-flex hose, and combines them with applicator innovations. The new applicator is built to spray for hours without interruption, no clogging! It is 20% lighter than previous applicators, making it easier to maneuver and keep spray accurate. The aircap allows the applicator to be used without a pressure tube, as solution flows directly from the cup through the fluid nozzle. Lastly, the Fan Adjusting Control is located at your fingertips and makes it easy to switch between small and large size fan patter. No pushing, twisting or clicking to change patterns...just turn the easily accessible dial by your fingertips. This addition to the Fuji Spray lineup provides lighter, easier, and smarter spray tanning than ever before. Gravity Top Feed Cup - Capacity: 3 Oz. Mini Turbine Dimensions: 17" x 13.5" x 11" - 23.2 Lbs. Dimensions 17" x 13.5" x 11"